Happy new year OHF readers. Its Brittni from papernstitch, back with another diy roundup. I thought, since its my first roundup of 2011, I better make it extra amazing. So I found, what I think are, the best home projects of the new year. I know I'll be making at least half of these in the next twelve months. And I hope you'll find a few projects to add to your list as well. Enjoy! Some projects just make you hit your forehead and say, "Hmm. Why didn't I think of that?" 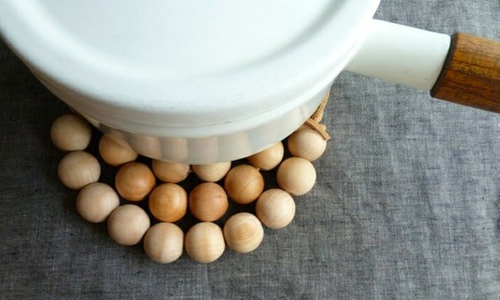 And this wooden bead trivet diy (above) is exactly that! I love the simplicity, and I thought you would too. For the step-by-step tutorial, click here. Natalie Jost of Olive Manna shows us how to make an easy can cover with some fabric ribbon. You can even get the little ones involved in this project if you'd like. Its so easy, truly anyone can do it. For the full tutorial, click here. 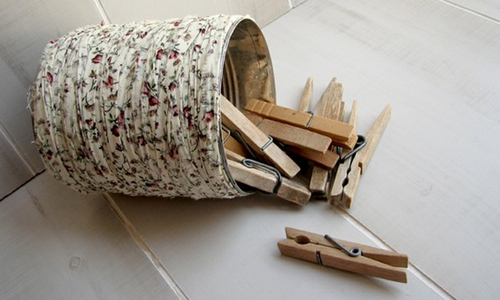 I never get tired of projects that make use of discarded materials, which are given new uses. 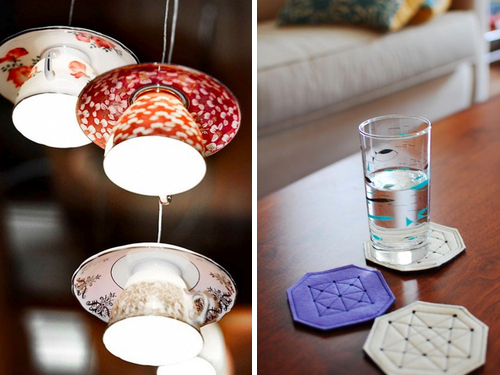 This teacup light design (found on ReNest) is a perfect example of such a project. I don't imagine it would be too hard to recreate either. As long as you feel comfortable doing some light electrical work (a basic hanging bulb kit should do the trick). And these coasters? Amazing. The secret tool that makes these coasters easy to recreate is a screw punch, believe it or not. Visit This is not my Work for the step-by-step. 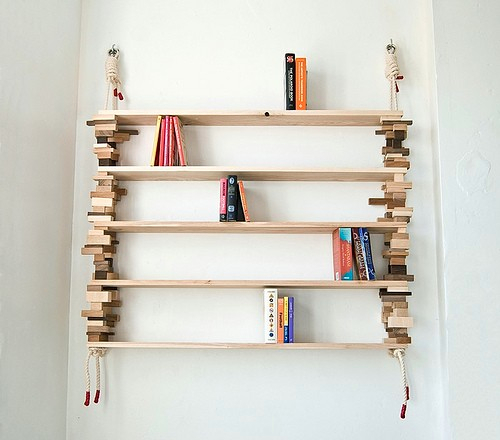 I think I saved the best for last this week, with a playful approach to your standard bookshelf, using little more than spare wood, rope, and a little imagination. It was actually a part of this great mini tour of furniture designer Amy Hunting's collection (found on Freshly Blended). And Amy actually won an award for this unique bookshelf (also known as a blockshelf) in 2010. With a few materials, you could make something similar for your own home, or buy the real thing from Amy herself. More info on purchasing can be found here. That will do it for this week. What DIY projects are you currently working on? I'd love to hear about it in the comments. Who knows, maybe it will show up in a future post. I love those teacup lights - the are absolutely stunning! i love the tea cup lights so much. I ♥ all of these! Sooo cute! glad everyone liked the teacup lights. i almost didn't put that one in the roundup. funny how that works sometimes. have a great weekend everyone! Those teacup lights are awesome! I must do this! Those tea cup lights are so adorable I absolutely love the idea. Such an inspiring post! P.S. Where do you get your flower cabochons? You have the cutest ones I've seen! :)Have a lovely day! the tea cup lights! TOO GOOD! I absolutely love the teacup lighting! That is so pretty. I also really like the fabric-covered can. That's something I can easily do that would bring some extra charm to my workspace. I love the tea cup lights - they're adorable! I'll definitely be trying to make the bead trivet too!